Bharatpur is one of the states in Rajasthan which is founded by Maharaja Suraj Mal. The state was founded in 1733, which is situated in the Brij region. Bharatpur was previously a walled city. It was also the capital of the Jats. The kingdom was ruled by Sinsinwar Maharajas. The states of Bharatpur, Dholpur and Deeg played an important role in the history of Rajasthan. Many fairs and festivals are held in the region, which are pretty famous. 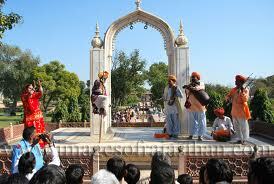 Brij Festival Bharatpur is one such festival which is also celebrated with much pomp and show. An overview of the entire festival is given below. The festival is held during the month of March. It is celebrated a few days ahead before holi. This festival is also held in a grand, elaborate and colorful manner. 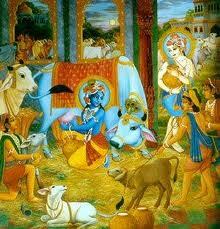 Lord Krishna is worshipped during this festival. 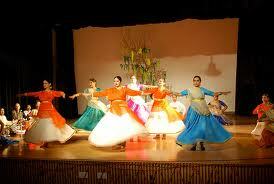 Various types of cultural festivals are also held. Bharatpur comes alive during this festival, the spirit of which can be felt. Brij festival is celebrated in nobility of Lord Krishna. The festival is celebrated a few days before the festival of colours-Holi. Raslila performances are the centre of attraction. 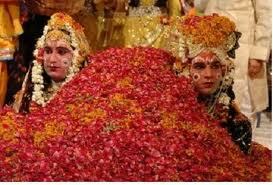 The villagers dress themselves inmulticolor attires and perform the love ballad- Raslila that give a picture of the eternal love story of lord Krishna and his beloved Radha. Apart from this folk songs and dances are also performed on this day. The entire region comes alive and looks magnificent with the beauty of dashes of colors in to the air. 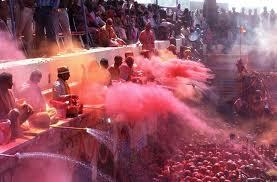 The zest and dynamism of Holi continues with the Brij Festival. Brij festival is one of the most popular festivals of Rajasthan. Lord Krishna has always been associated with the devotional songs, paintings, sculptures or engravings. 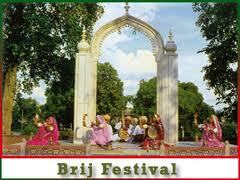 The Brij Festival is celebrated with a lot of enthusiasm in Rajasthan. The Dance is often a part of the cultural music and the stories or Nayaks who are Pabu Bhopas, have a female accompanist; together they recite the phad (a painted ballad). The festivities are usually tagged with folk dances accompanied by music played. Men and women, young and old, rich and poor-all are touched by the spirit of this festival. Brij festivals have popularized Folk opera by the professionals and amateurs. All the people, men or women, young or old, irrespective of their caste or creed participate in the Brij Mahotsav and drown in its spirit. Whole of the place is painted in bright colors and everyone plays with colours and paints each other. People welcome spring with celebrations and gaiety. 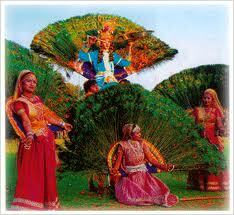 The fair reflects the true traditional culture of Rajasthan. 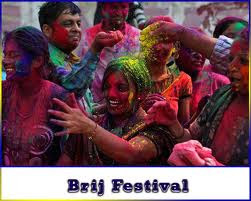 Brij Festival of Bharatpur is a major and famous festivals, celebrated by the local people as well as tourists from all over the world come here to witness the saga. Tourists take part in this colorful festival and enjoy and witness the festivity. The rhythm of folk songs fills the atmosphere with the fragrance of romance. The entire place is painted in brilliant colors and no one is spared from being splashed with colors. The festival is an attraction for the natives and also for local tourists and international tourists as well. The spirit of fair resonates with hues of Rajasthanculture and heritage. Devotees assemble at the Radha Krishna temple in the morning and take bathe into the holy water of Banganga River. It is believed that the holy water will purify ones soul. They then offer prayers in nearby shrines of Hanuman, Ganga Bihari, Lord Shiva and matha of Goswamiji. During the festival, young and old, men and women, ring with the lively folk melodies and splash colors on everybody. Bharatpur is situated on the Delhi - Mumbai main railway line and also on National Highway no. 11 (Bikaner - Agra). The nearest airport is Agra, which is about 54 kms from Bharatpur. Agra has daily flights for Delhi, Bombay,Varanasi (via Khajuraho) and Lucknow. Bharatpur is on the main Delhi - Bombay line with regular connections to Mathura, Sawai Madhopur and Kota on the same route. It is also connected with Agra. Bharatpur is well connected by road with Agra, Mathura, Delhi and Jaipur. Regular bus services operate for all major cities. The road distance of Bharatpur from Agra is 55 kms, from Fatehpur Sikri is 22kms, from Mathura is 39kms, from Delhi is 184 kms, from Jaipur is 176 kms and from Alwar is 117 kms.